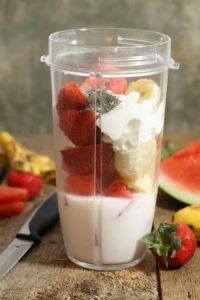 This strawberry watermelon smoothie with orange and banana, is an easy way to kick of your day. 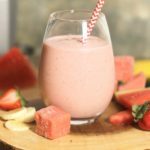 While you can easily drink this healthy watermelon smoothie for breakfast any day of the week, it also makes a refreshing summer drink to be enjoyed on a hot day. Here in Canada, these are all very much seasonal fruits and its not uncommon to see 12 dollar watermelons the size of a cantaloupe. Especially if it’s not summer. Now that’s an expensive (and small) watermelon! 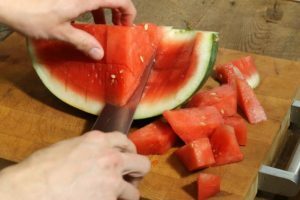 Once summer hits, watermelons are cheap, strawberries are in season, (or growing in my backyard), its a good time to load up and eat as much of this healthy fruit as possible. Can You Use Frozen Watermelon For Smoothies!? This is a question that I’ve heard a surprising number of people ask, and the answer is yes! I actually recommend freezing the watermelon for this smoothie. This allows you to leave out the ice, (which most smoothies use to cool the drink), while at the same adding that icy freshness to the smoothie without loss of flavor. Frozen strawberries can also be used, though if you have fresh ones growing in your backyard garden or growing in pots, obviously use those first! I have never seen frozen watermelon for sale…why? Who knows. But this means you need to freeze your own. Run your knife perpendicular to the pervious cuts to create cubes. 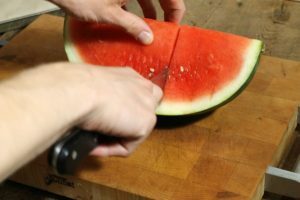 Run the knife along the peel to remove the cubed sections of watermelon. 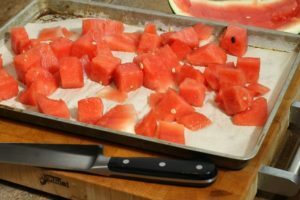 Lay these watermelon chunks on a parchment lines sheet pan or cookie tray and put them in the freezer. The watermelon cubes take about 20 minutes to freeze solid, at which point they are ready to be used in smoothies! If you don’t have a freezer don’t worry, just use fresh watermelon, the smoothie just wont be as ‘icy’ and thick. 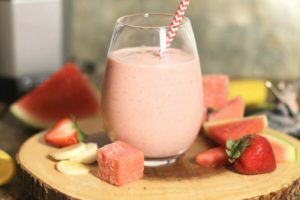 This creamy strawberry watermelon smoothie will quickly give you a boost of energy and easily fill your daily requirement of fruits. The yogurt, chia, and milk provide protein and dairy, and the orange a healthy dose of vitamin C. A great breakfast smoothie especially on a hot summers day. Simply add all the ingredients to a blender and blitz it up! I use a Ninja Bullet blender for mu smoothies because I find the large cup to be the perfect size to create one really big smoothie, or two normal sized drinks. Perfect if you are whipping up a smoothie for breakfast or as an afternoon snack. The Ninja Bullet is also much more affordable then say a Vitamix, and is easily packed up if going on vacation or on a road trip. 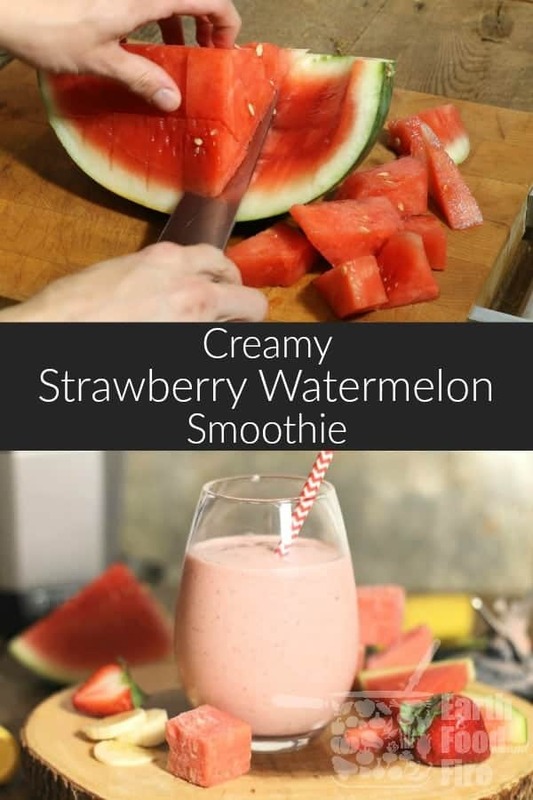 If you want a chunkier smoothie add some more watermelon to mix. Adding in another half banana or more yogurt will increase its smooth creamy-nes, and adding more orange juice or milk will thin it out. What Other Fruit Goes Well With Watermelon In A Smoothie? This is completely up to you of course. That said a few fruits and even vegetables pair quite well with the sweet melon. Lemons and limes are a great match and provide a nice balance of flavor to the sweet melon. Raspberries either fresh or frozen are another great way to add tartness to a smoothie. Try adding mint and raspberries to a watermelon smoothie for a refreshing summer drink! Blueberries add a punch of flavor and also boast antioxidants. Kiwi is another good option as it adds sweetness as well as some fiber which can help bulk up the smoothie and make it thicker. The great thing about smoothies is that you can experiment with varying fruits( and even vegetables) to create endless variations. Mix all the ingredients together in a Ninja Bullet or other blender until smooth. Got me thinking about freezing watermelon. How long do you think it will last for? Summer smoothies in Fall? It should yes! As long as it’s frozen and stored in a freezer bag it shouldn’t freezer burn or go bad! 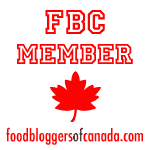 I love watermelon – especially during the warm summer months – so I can’t believe I’ve never made a smoothie with it! Time to change that! Love the blend of different fruits in this smoothie! Will definitely want to try it this summer!